To the heart that gives it's love?" 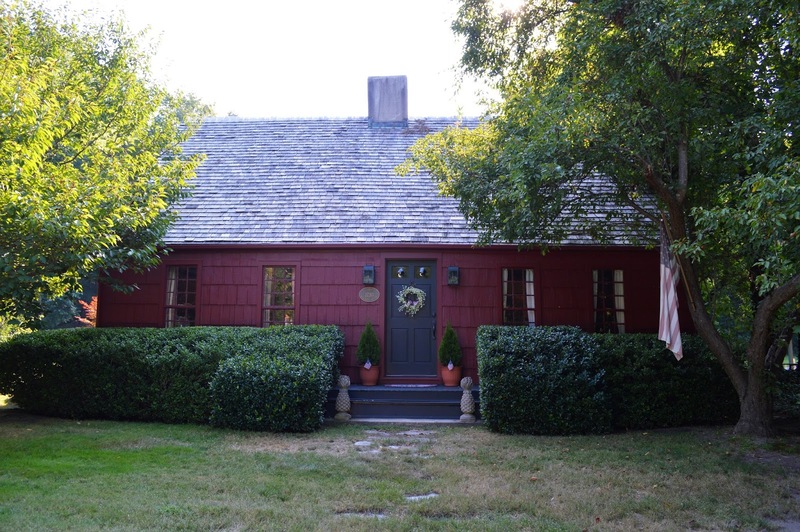 There's a source for everything, and what inspires my daily life the most is my love for old houses, and in particular, this little red cape in Setauket, New York. 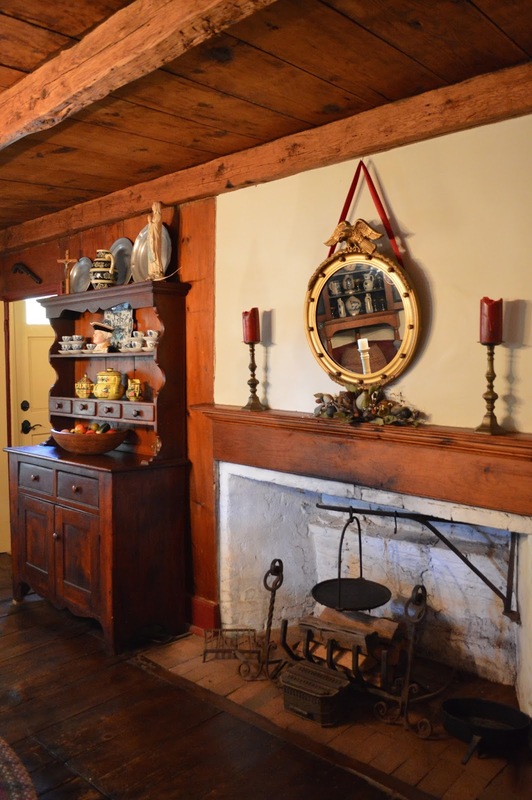 The Alexander Hawkins House, built around 1730, has stood in the same spot since before the American Revolution and is every old home enthusiast's dream. I've had my eye on it for over a year now after touring it last August during an open house and it has stayed in my heart ever since. If you look up at my header, there it is too! A source for everything... it is this house (or something like it) that aspires me to fuel my passions, to revitalize this blog, to one day live in something as full of character and natural beauty. Fortunately for me, it's still on the market, and I was able to attend another open house yesterday afternoon. I thought you'd all like to see what I've been raving about-- and be warned-- these photos are not for the faint of heart! The amount of care and attention to detail the owners have put into this house over the years is beyond impressive, not only manifesting physically but spiritually as well. This house so full of love and warm energy, one can't help but feel compelled to crawl onto the sofa and open up a book. Stepping through the front door, you feel you're coming home. Setauket, New York possesses an illustrious history, having made a huge impact during the Revolutionary War in particular. If any of you are familiar with AMC's television series, Turn, the plot is (very loosely) based on George Washington's Culper Ring, America's first organized spy ring which aided in gathering information against the British and ultimately winning the war. Most of the key players involved in the spy ring all hailed from Setauket, and more than likely knew Alexander Hawkins personally. 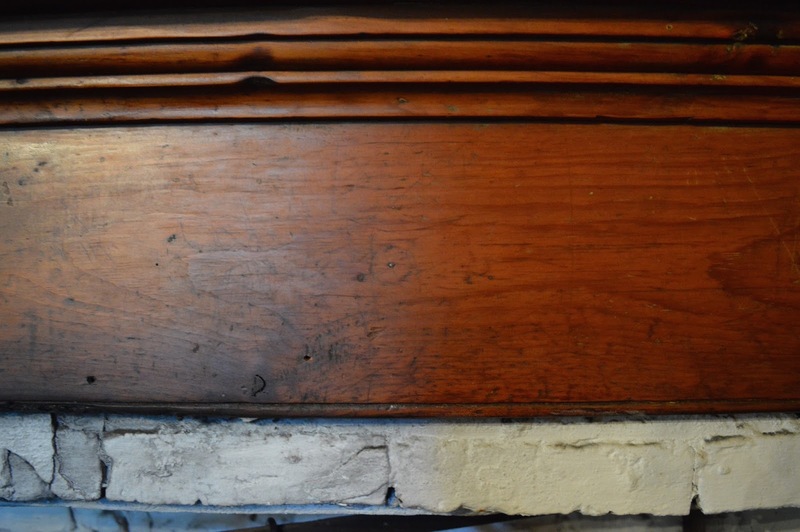 If you look at the photo above, you will see etchings in the mantel place in the Hawkins' dining room. 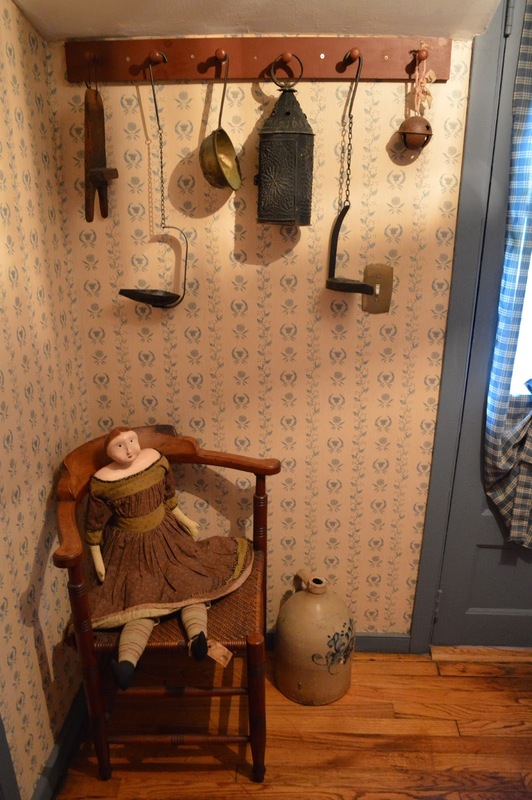 These etches were secret signs that informed other Patriots that this was a "safe house." Hawkins, like many others living in British-occupied Long Island, resented these uninvited intruders, and were great supporters of the Patriot cause, but had to do so discreetly. Here, in the kitchen, a fireplace with a pretty crooked mantel is showcased. Superstition has it, these were deliberately designed as such to ward off witches from climbing down the chimneys late at night. 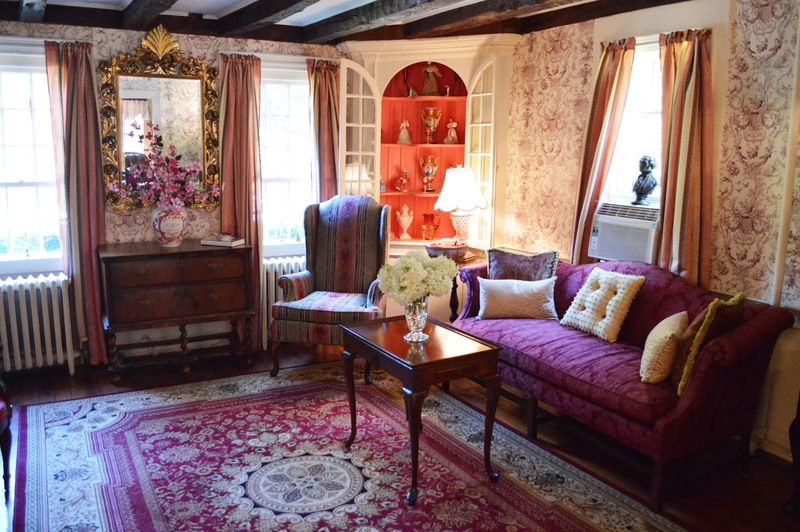 The ornately designed parlor with original built-in hutch. The parlor fireplace, also slanted (witch free zone! ), with intricate moldings. 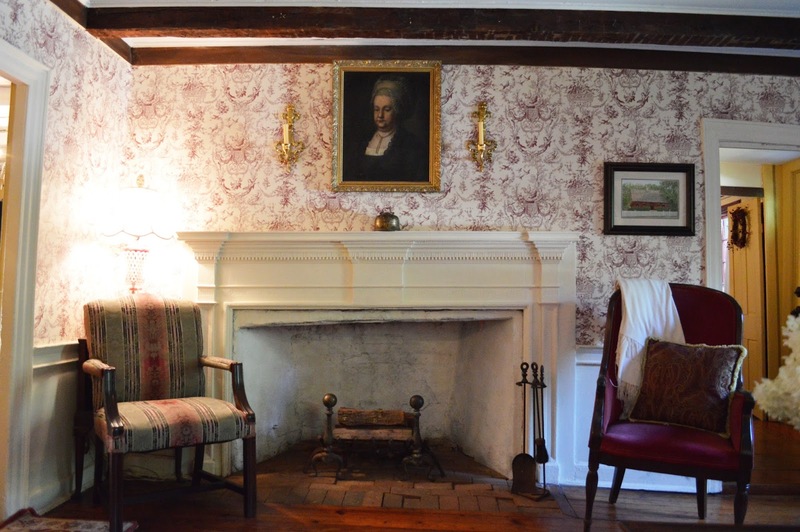 Details in the entranceway, such as a painted canvas on the floor (widely popular in colonial times), and a framed map of Setauket greet visitors stopping by. 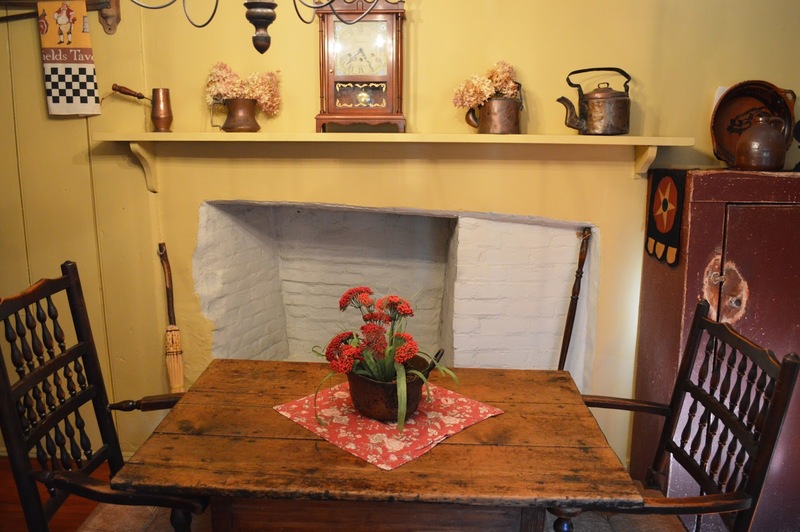 An alternate view of the dining room with the original kitchen hearth. 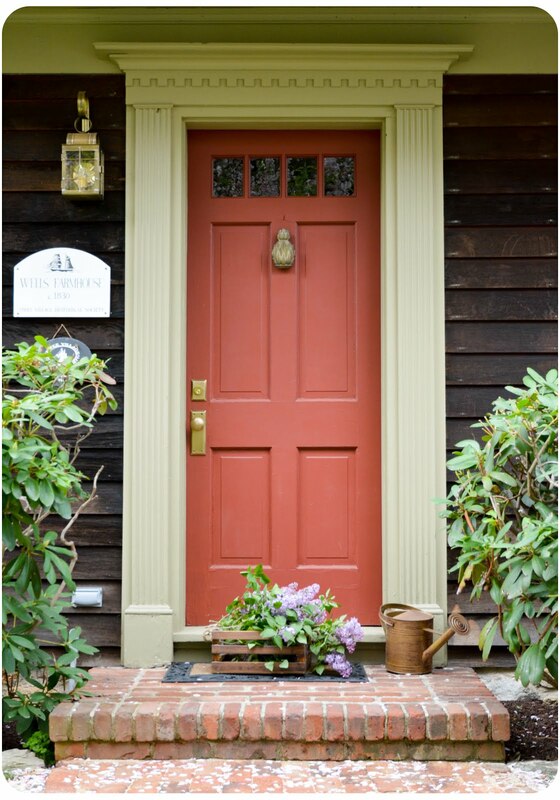 Charming, well thought out details adorn the house, pleasing you at every corner. 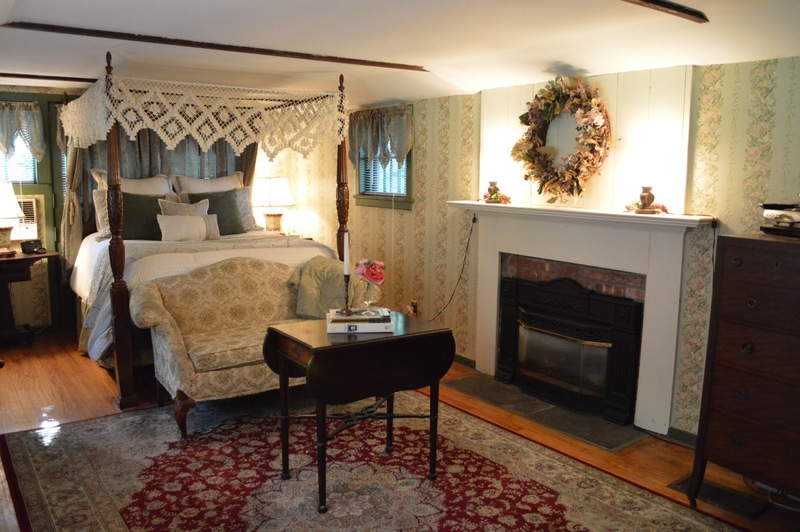 The first floor master bedroom was originally... a chicken coop?! 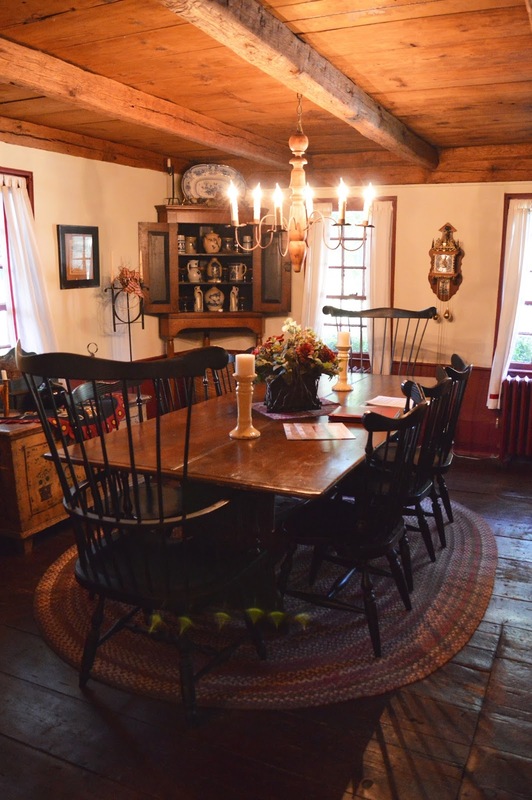 Dating back to the 1850s, it was rescued from a nearby farm in the 1940s and made into a rear addition of the house. Quite the transformation! The three upstairs bedrooms are simple and inviting, the way every bedroom should be. And if you thought this house couldn't get any better, take a look at the property: you are now viewing the back of the house, facing the rear addition. A screened in gazebo awaits summer cocktails on these sultry August evenings. 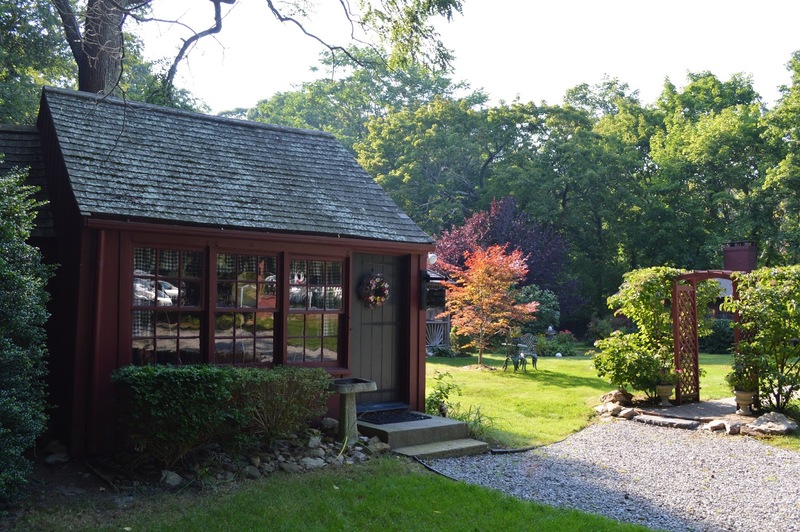 A two-room cottage on the property has multiple uses; a guest house, artist gallery, or reading nook, to name a few. Could you picture yourself sitting here? I could, each and every day for the rest of my life. For more information on this one of a kind gem, please visit Coach Realtors here. I hope that whoever is blessed enough to become the new owners of this home will treat it with the respect and adoration it so rightfully deserves. This house is magnificent. You will have, if not this one specifically, then one very like it someday soon. I know it. Actually not a bad price for the house, land and additional structure. Still too pricey for me as I have just one income and the cats haven't found jobs yet. Same, Elaine. If I had the money, I would have made an offer a year ago! I grew up in New England and it never leaves your soul. This house is wonderful! I particularly love the ceilings and floors, so warm and inviting. Thank you for the tour and the history; really enjoyed it. Believe it or not, this isn't New England but Long Island :-) The architectural styles of this period on Long Island are identical though! I'm so glad you enjoyed the tour! It's beautiful, Erin. Definitely a dream house! This is my kinda house! Love its unassuming simplicity and charm. I'm surprised it hasn't sold. 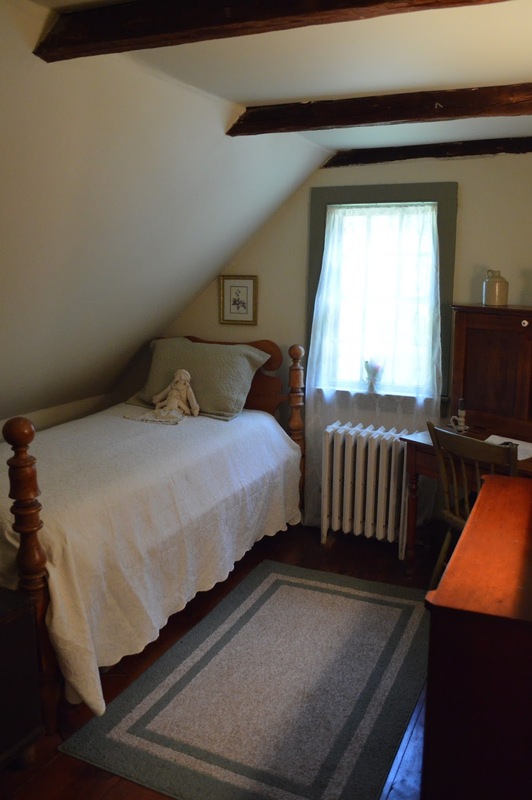 The bed tucked under the eaves is one of my favorite pics - so cozy. 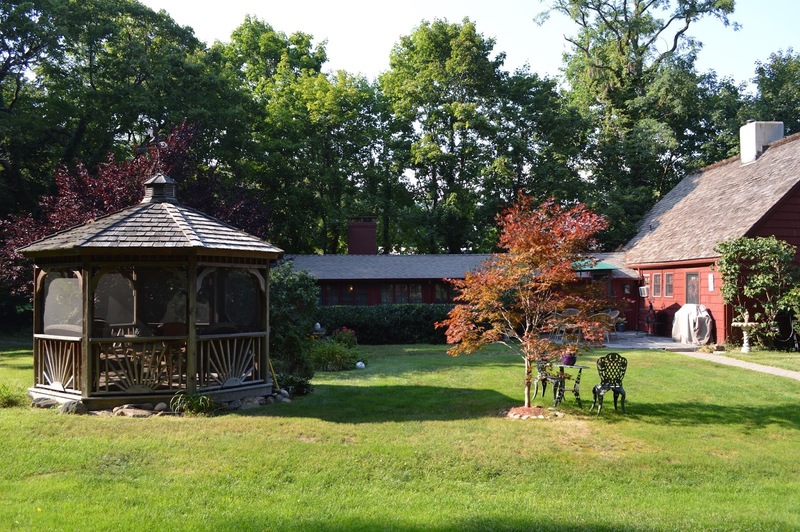 Lisa, Long Island is sadly a completely different market than up in New England; old houses are rarely sought out and overlooked for contemporary "McMansions." Good for me though, I guess! Oh my goodness Erin......this home is so beautiful and cozy! I agree that with a cup of tea and a good book I could sit underneath that beautiful blooming tree all day! My favorite is the wooden floors that have the rug painted onto it! I agree with your Mom...one day and soon I hope you WILL have the dream home of your own. Thank you for sharing your thoughts and this beautiful home! What nostalgic memories you've just evoked, Erin. 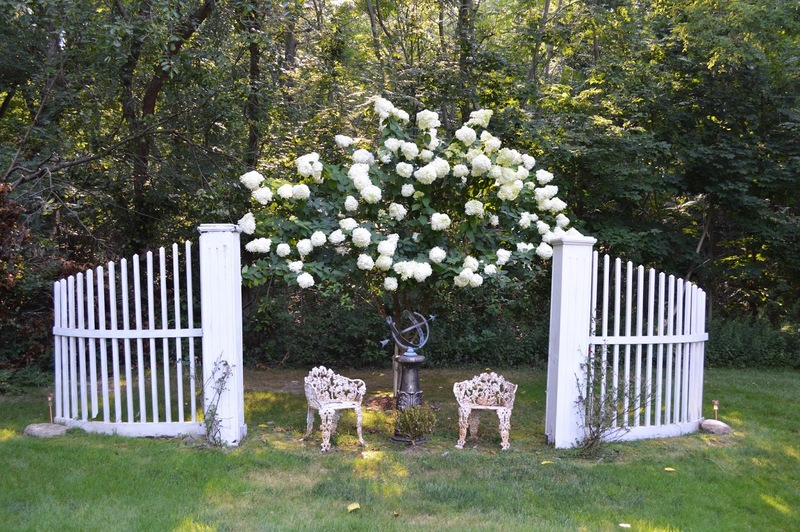 For nine years our family was blessed to live in the Seekonk & Rehoboth, Massachusetts area where I became conscious of the history of New England. The latter two years we lived in the country in a house built in 1904 which, to us, was 'ancient,' but did have a modern kitchen and laundry room addition that I adored. Such fun I had 'playing house:' searching for and buying a few antiques, herb gardening, and daydreaming in general. I do hope you realize your dreams while thoroughly making the most of the charming place you currently call home. Thank you for sharing. 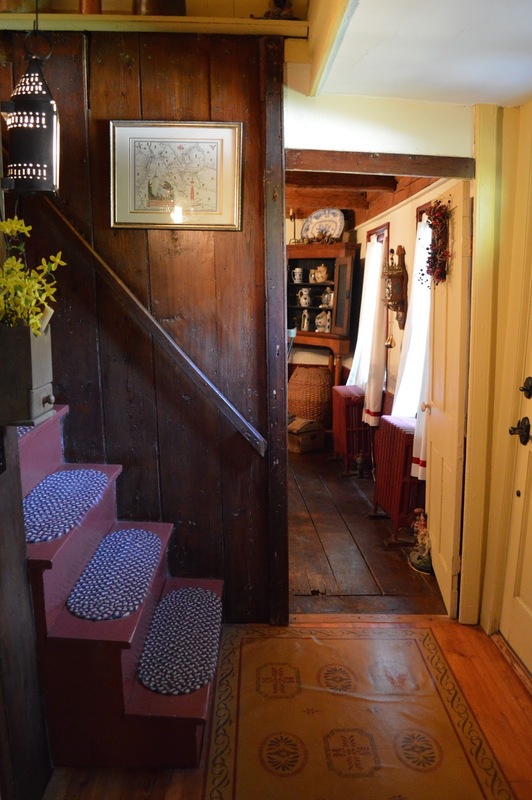 Adorable house, but sadly, the price is out of reach for a good majority of us "common folk". Hopefully someone will purchase it who will appreciate it for the historical gem it is and give it the care and love it deserves. what a cute place! i am so glad you are back! right now i am not loving old houses too much. this renovation is killing me! i am having a dozen windows remade. of course, each one is a slightly different size so everything is custom. the pounding and dirt is bad enough but i have workers everywhere. two more months and it should be done...maybe! I'd be happy with the adorable cottage in the yard! What's not to love about this piece of living history! Thank you for the tour! I so wish you could buy it! Such a beautiful house. Sneakers at Temperley? We never would have believed it either, had the way not been paved by Chanel and company in previous seasons. Those looking to Alice Temperley for glamorous evening looks may be initially disappointed with the Spring 2015 collection, which was jimmy choo shoes a much more relaxed, laid-back affair, showing predominately separates in breezy shades of white, red, pale pink, and cornflower blue. The reason? The Somerset-born designer combined her Alice by Temperley offering red bottom shoes christian louboutin with the main collection this season to create a full day-to-night range, rather than the usual evening and cocktail attire. But never fear, the jacquards, embroidered details, and ornate evening sparkle jimmy choo boots were definitely not in short supply. Key pieces included a nautical rope-print dress with lobsters on the hem, a pale pink evening gown with jewelled hip panels, and long open skirts jimmy choo outlet and button-downs worn over cropped slacks. Prepare to layer up, slip on those comfy shoes, and take British glamour in a relaxed new direction. Every season during Fashion Week, we go christian louboutin backstage at the tents to mingle with models, chat with beauty pros, and interview the occasional celebrity. This year, we spotted some crazy things behind the scenes at NYFW (wait, is christian louboutin that Kendall Jenner?). Pierced eyebrows, P'Trique, and pastries all made our must-see list on Instagram. But here you'll also find shots that didn't make the cut — like our mani-cam moment red sole shoes christian louboutin backstage at Donna Karan. We're opening up our NYFW photo diary to give you the most exclusive access to everything that happened before the runway music even started.